Okay, The Legal Genealogist was feeling very very disappointed earlier this week. But a little more research turned up the clue that makes me happy again… and looking forward to that “some day” when my time is my own and I can travel to where I want to be when I want to be there. Because that would require a time machine. The place, you see, is the Louisa, Virginia, Fairgrounds. It’d be the time when forty-‘leven cousins would be piled into the bed of Uncle Billy’s pick-up truck as part of a caravan for the 15 or 16 miles from our grandparents’ farm near Kents Store in Fluvanna County. Yes, it was legal then. No, we weren’t wearing seatbelts or helmets. Half the time we weren’t even sitting in the truck bed; at least we bigger ones would be perched on the sides. When the roads were gravel at best and dirt more often. When the air was hot and sticky and we wore pedal pushers and flip flops. When boys got buzz cuts for the summer and girls under the age of 10 didn’t bother with shirts unless we went to town. And when going to town on the Fourth of July meant gathering together with everyone I loved… and going to the Fair. It was one of the highpoints of long hot summers spent at my grandparents’ farm. My mother would pack us up within hours of the end of the school year for the 300-mile drive from our New Jersey home to Central Virginia, and my aunts and uncles around the country would pack up their kids and head for the farm as well. For a few days in the middle of June, we would all enjoy each other’s company and the novelty of all those extra playmates and sing-alongs under the trees. And then the novelty would wear off. And we’d start thinking more of the downsides than the upsides of all those people in one farmhouse. Of chamber pots and outhouses instead of indoor plumbing. Of open windows and fans (if you were lucky) instead of air conditioning. Of the snakes in the creek instead of the floats in our backyard pool. By the Fourth of July, those forty-‘leven cousins would be divided into camps: them against us, me and her against those, them and those others against me and her and him. Grownups would be spending as much time breaking up squabbles as visiting. And everyone — everyone — was glad when the Fourth of July rolled around. Because going to town on the Fourth of July meant gathering together with everyone I loved… and going to the Fair. More troublesome to us cousins was the fact that, for some reason I have never understood, we always left there a little early. Oh, we got to ride the ferris wheel and, if you had the stomach for it, the tilt-a-wheel. We pitched softballs at targets trying to win stuffed animals. We ate snow cones and cotton candy and listened to the music. But what we never, ever, got to do was stay for the fireworks. Every year I can remember, not long before the fireworks were to start, the grownups started rounding us up. Stragglers tried to hide and wait it out, but we got collared and hauled off and dumped back into that pickup bed for the ride back to the farm. Every year I can remember, every kid in that pickup had eyes glued to the north-northeast as we drove away from the fair. Every year I can remember, we tried to see what we could of the fireworks as the caravan of truck and cars headed back to the farm. And every year I can remember, we gave up after a few minutes when the trees and the dust from the road obliterated any real view of the skies over Louisa. So I have entertained the fantasy in recent years that, one day, I would go back to Louisa on the Fourth of July … and stay for the fireworks. But when I tried to find the Louisa Fair online, I discovered that the County Fair — which is what I thought the Fourth of July Fair was — is an agricultural fair later in the summer these days. And for a moment I was feeling very very disappointed. But then I discovered through a little broader online search that there is a Fourth of July Fair in Louisa. And this year was the 71st annual Louisa County Firemen’s Fair, sponsored by the Louisa Volunteer Fire Department. So a trip to Louisa on the Fourth of July is back on my bucket list. 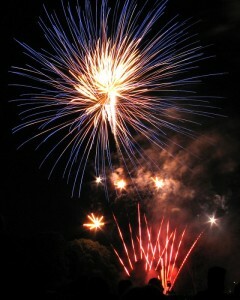 I’ll go to the Louisa Firemen’s Fair one Fourth of July in the near future. I’ll ride the ferris wheel and pitch softballs to win stuffed animals. I’ll eat a snow cone and cotton candy and listen to the music. And I’ll stay until the bitter end and watch every one of the fireworks before even thinking of trying to find the car. And — just for a moment — I will close my eyes and take a deep breath. And I’ll pretend — oh only for that moment — that I am one of forty-‘leven cousins piled into the bed of Uncle Billy’s pick-up. That the roads are gravel at best and dirt more often. That the air is hot and sticky. That the boys all have buzz cuts and the girls are wearing pedal pushers and flip flops. And that I’m in town on the Fourth of July, gathered together with everyone I loved… so many I loved and have lost… all together one last time at the Fair. They will be there with you Judy. Now that brought tears to my eyes, Roberta. Thanks. You’ve painted the picture so well that I can taste the cotton candy and smell the dust. I hope you get to see the fireworks soon! Wonderful images, Judy. So clear. Hopefully you have some photos of those times as well as your memories. I still remember how every summer all the boys in our neighbourhood got velvety-feeling buzz cuts from their mothers or fathers – whoever was wielding the clippers. I’ll be looking forward now to your post next year about your wonderful experience at the Fair. Bravo! Crystalline imagery…………….I smell the fair, the truck, the kinfolks. Thanks so much for the kind words, Janette. What a great story. Reminded me of a time when we went to Old Settlers Reunions (never did figure out who they were)every summer. The only time my grandfather would leave town unless one of his children or grandchildern needed him. Wouldn’t it be neat to figure out now just who those Old Settlers were??? Thanks for the kind words! I loved your writing in this post. Really evocative of time and place. I wondered what could be a reason for never staying for the fireworks. Could someone who had PTSD have been among the adults? (He may have been in a previous generation, and the early return home became a tradition). You know, I hadn’t thought of that, but it’s entirely possible. My Uncle Billy himself was a Navy veteran of WWII. I’ve told you before, but I’ll tell you again–I love the way you write! This brought back memories of childhood visits back home to see the relatives, but to Arkansas and Oklahoma, not Virginia. And the county fair was in Stockton, California and there were no fireworks. And yes, most of those folks have passed on. Okay, now you made me squall, Judy! This is just beautiful! Maybe we all have memories of unfairnesses done unto us during our childhoods, regrets that we never got to do such-and-such a thing, or disappointments that something we always dreamed of back then never happened (don’t EVEN get me started again on the promised real Barbie doll I never got and that ! *#&$ “Tina Marie” doll they tried to pass off on me instead! – but I regress…). I sure hope you get to see those fireworks soon, and that they are every bit as spectacular as you always dreamed they would be! Oh gosh, this is just like our visits to The Farm in SC during my childhood. Riding in that pickup truck was one of the best adventures in my whole life. We left early too, dang it. The best part of riding in the pickup truck was when we were on the farm roads, off the paved roads. That’s when my uncle would let down the tailgate, we would ride on it, and he’d see if he could bounce us off. Sigh. These days if anybody tried that, somebody would call Child Protective Services.